June 2019 is World Pride in New York City! Celebrate Equal Rights on our NYC Pride Fireworks Cruise, or come support the Hetrick-Martin Institute on our weekly fundraising Pride Sails! These events are just the thing to balance a long hot day in the NYC Pride Parade. Join us to celebrate the future of our nation without discrimination. 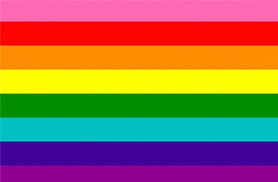 Come with a group of friends or loved ones aboard one of our classic boats to take in the beauty of this colorful Gay Pride event on the Hudson River. 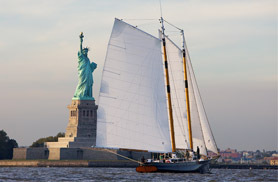 All of our yachts will cruise out into New York Harbor to view the icon of freedom: the Statue of Liberty. On our Trans New York Harbor Pride Sail for the Hetrick-Martin Institute, enjoy a morning mimosa and a nearly 400 square foot Pride Flag flying proudly from our mainsail! On our Gay Pride Fireworks cruises, sit on our open decks of our classic schooner or motor yacht and enjoy the best view in town for this memorable showcase of sparkling fireworks at the culmination of the Pride festivities in New York City!